I’m sorry if I’m feeding your Coach addiction but sometimes you can score some great deals with these coupons and I don’t want you to miss any great deals. 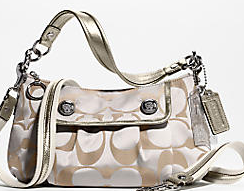 So, here is another 20% off at any Coach Factory Outlets coupon. This one is good through 1/31/10 so if you are planning an outlet trip this weekend, print it out and see what you can find. Need to find an outlet? Check out a Coach Factory Location near you. Let us know if you score any great deals!